Do you want to be a Successful Entrepreneur at young age? Many of us have read and listen this popular statement of Mark Twain several times but how many of us implemented it in our lives it depends on us. If you are waiting to do any work just because of you think that your age is not appropriate to do that work or achieve that goal then you are wasting your talent and precious time. In this fast and phantasm technology world you have to be according to the current generation or situation if you wish to get something extraordinary or something different that never achieved anyone. Here i am going to talk something about – how to be an entrepreneur at a young age? I used the word “young age” because age doesn’t matter in entrepreneurship. Entrepreneurship is all about what you think and suggest others for developing, organizing and fairly managing a business venture along with any of its risks in order to make a profit. And i think the capacity of being an entrepreneur can be in any age of people either a teenage boy/girl or a senior citizen, if they have the passion and interest to do it. If you are a teenager and thinking about becoming a famous entrepreneur then you are not thinking something impossible, you can do it proudly if you have set your goal and are ready to face all the situations which will come in order to achieve your goal. Try to see the future even though you are looking at the present. Get your own understanding of how the industry will develop. Do not worry about being wrong. People want to see your developed ideas not those ideas that they have seen before several times on several places. If you are willing to do something extraordinary then at first stop comparing yourself with anyone, you will lose your uniqueness and speciality by comparing yourself with other. If you are only planning and thinking about your business or project then it will not work. You need to tell the people what you are going to do something new / special and present a demo of your work your plan. You will be surprised how many people will want to work with you once you start doing things. Be confident and do your work with extremely passionate nature. You know your business better than anyone else, so no need to follow the instructions of anyone blindly. Most importantly, you know yourself, so trust yourself. Find a really specific small problem, talk to 100 people about how to solve it. Then just decide on one solution. Once you decide, just execute. As much as you will confuse, you will be distracted from your actual goal. Always try to be with the best one not with the average one when it comes about the decision making. If you don’t see yourself working 80 hours a week on it then it’s not your passion. Find your real passion which you really wish to do. It is the kind of thing you do really well, even when you are overworked, angry, and starved. Whether you code or not, you can easily build a simple 2-5 screen prototype. This is also a part of your strategy and planning. So, it’s over to you manage it. I hope you got some very useful information from this tutorial about how to become an entrepreneur at a young age. Feel free to share your view with us by writing in comments. Your comments will be always appreciated here. Thanks for this really inspirational post. I completely agree with your points. Age doesn’t really matter when it comes to starting a business. Believe in yourself. Do your best work, stay on schedule and you can do anything if you follow your dream. Thank you for the great advice and being a wonderful inspiration. Keep up the good work! First of all your most welcome on Zerodollartitps and thank you so much for sharing your comment on this article. Yeah, you are absolutely correct dear – “Any age is the perfect age to follow your dreams. You are never too young or old, age is just a number “. “Age is an issue of mind over matter. If you don’t mind, it doesn’t matter”, and a BIG yes for it. Yet, the frustration arises in the mind leading to being overwhelmed when the plans executed doesn’t be fulfilled as it was planned to. Mostly, it happen when we’re distracted from the surrounding and opt for something else which eventually looses our confident towards the goal our mindset have been set on. Perhaps, I’ll be against working 80 hours week as because it isn’t something pride off. Yes, we can give our best efforts but being young we aren’t yet invest that much time. The best way to play it off, is having a planned schedule which not only will help you to execute each and everything properly but you’d be in a time span and you’d get managed with it on the way off. It’s really great to see you here. At first your most welcome on Zerodollartitps and thank you so much for sharing your valuable view on this article about – How to Be an Entrepreneur at a Young Age. You are also a nice example of being an Entrepreneur at a Young Age. I am happy to see you here Bro. At first your most welcome on Zerodollartitps and thank you so much for sharing your view view on this article. Yeh, passion is the thing that assure the path of success. If you have passion to do any work in correct way then you can achieve your target just within few effort. I came across many entrepreneurs who claim wanting to be a great one. Here’s the fact (as said on FB), 99% of them fail. They aren’t serious and when I mean serious, you can’t start a business without dollar and cents. You need some money to start up and that’s the reality of 2014 and beyond. Why? Entrepreneurs will find ways to make more money … even taking a part time job! You are saying correct most of the people who wish to be an successful Entrepreneur they fails due to lack of passion and seriousness. Thanks for sharing your valuable comment with us. This is indeed an inspirational post. Come again, what is Bill Gate telling us? Comparing ourselves with others is indeed an insult to our own personalities. This to me is the best quote I have ever heard. What do we see going on in this world. We have various people going about comparing themselves with others and having various excuses as to why what they’ve planned isn’t going to work because of their age or race. Thanks for sharing with us this insight and do have a great day! It’s really great to see you here Emmanuel. I am so…so much glad to know that you loved this article and felt touched. 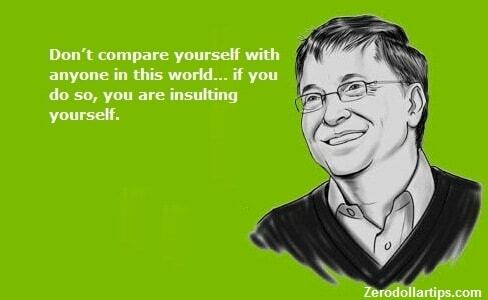 I am huge fan of this quote said by Bill Gate and i follow it in my routine. Nice article you’ve just said it all. Actually this is kind of motivation to me “Age Isn’t a limitation” I’ like it where you said “Block the doubters instantly” that word isn’t only for those wanting to be entrepreneurs at their young age it’s for every body. On daily bases you face challenges that wish you to succumb but determining and saying “NO” will be the only way out. Thanks for the big share. Great to see you here Bro. At fist your most welcome on my new Blog (Zerodollartips.com) and thank you so much for leaving a valuable comment. I am very happy to know that this article inspired you so much. Very nice and inspiring post for Entrepreneurs. Taking risk up to a certain level makes the Entrepreneur successful. Indeed your points can guide anyone that how to become a good entrepreneur. Its really good to read your articles here. I mostly come here to read your post, all are well described and easy to follow. Good stuff bro!! and thanks for sharing your valuable knowledge for us. You have covered all the point we need have to be good entrepreneur at young age, there are many teen entrepreneur i have seen in my blogging carrier, but i haven’t see article on how to be entrepreneur at young age. So it’s just something unique for me and thanks for sharing such a nice article. I am quite happy to know that you found this article useful for you. I hope, this article motivated you and inspired you to be an Entrepreneur at a Young Age. Happy to see you here. Keep coming and sharing your views with us. how good is an online business? and can it supplement a normal job? I am just 19 years old and try to get into it.